Spiritual answers to questions about being in the spiritual grace, Presence of God’s Peace, Love and Wisdom. Our thoughts create our feelings ABOUT our life. We all have an inner Presence of Peace. Our conscious feeling of the Presence creates our thought IN our life. What is Three Dimensional Spirituality? The Physical includes all things seen by the rational head. The Spiritual includes all things unseen which are sensed by the conscious heart. Three spiritual things that exist which are unseen are Conscious Feelings, Rational Thoughts and an inner Spiritual Presence which contains Peace, Love, and Joy. There is a Wisdom that comes from the experience of the Presence. All of us are always looking for one thing: to feel good. All of us always solve all of our problems with only three solutions. One Spiritual Dimension is our feeling about what happens to us. Here we think events create our feelings. Negative events create negative feelings. If we can change the event to being positive, we then can feel good. If we cannot change the event, we become victims to it. Two Spiritual Dimensions contain both Rational Thought and Conscious Feeling. It understands our thoughts, not events, create our feelings. Change a negative thought about an event and you change a negative feeling into feeling good. If we cannot find a good thought we will never find closure to what happened. Three Dimensions uses Conscious Feeling, Spiritual Presence and Rational Thought. When we cannot change the negative event or thought, we can transcend them by being open to our Spiritual Presence. 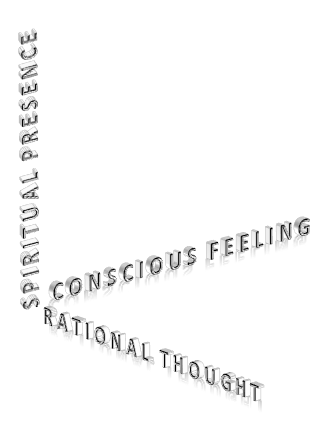 When we are out of the Presence our, rational thought creates our conscious feeling about the event. When we are in the Conscious Feeling of the Presence of God (good), Rational Thought gives us Wisdom in and not about the event. It is here we become victors, not victims, of past events and we find closure from past memories.